Picture - The Nine Worthies. A group of actors present a pageant before the King in "Love's Labour's Lost." 1598 Engraving from a painting by R. Hillingford. 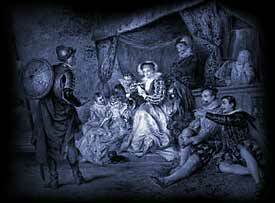 It is believed that Love's Labour's Lost was first performed between 1594 and 1595. In the Elizabethan era there was a huge demand for new entertainment and Love's Labour's Lost would have been produced immediately following the completion of the play. It is believed that Love's Labour's Lost was first printed in 1598. As William Shakespeare clearly did not want his work published details of the play would have therefore been noted, and often pirated without his consent, following a performance. The setting is Navarre, a province in northern Spain bordered by France. The number of words in the script, according to the Complete Public Domain Text is 22,994. Ferdinand the King of Navarre and the Princess of France. The following quote is from Love's Labour's Lost. Details of this famous quote follows, complete with information regarding the Act and the Scene, allowing a quick reference to the section of the play that this quotation can be found in. Please click here for the full text of the script of the play. "Sweet hearts, we shall be rich ere we depart" (Act V, Scene II). Love's Labour's Lost is not based on any historical events or people. Inspiration was probably taken from Renaissance literature.